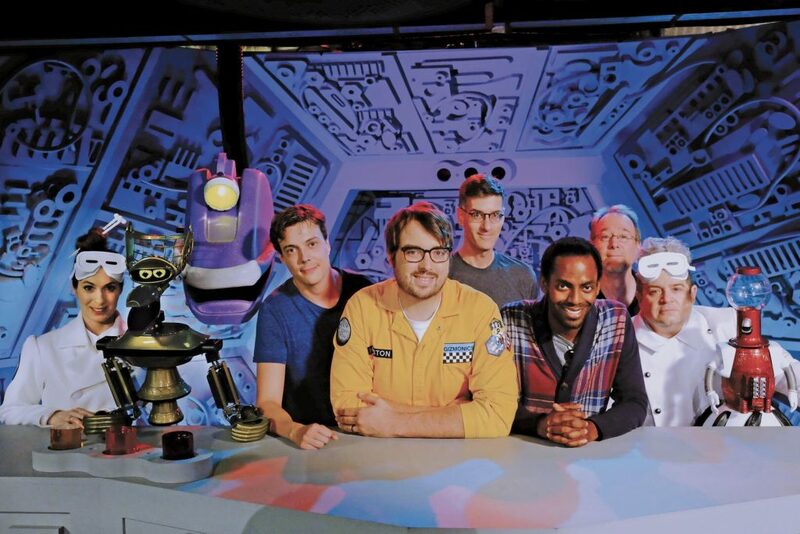 I know I started mentioning this in my most recent post, but I thought I would take some time to talk about the new season of Mystery Science Theater 3000, season 11 on Netflix. Of course I have no doubt that a million other articles probably hit on this same subject over the weekend, but I just thought I would share my thoughts on it. First of all I’m going to say this, I know there are those of you out there who probably are all over the fact that it’s not season 11, but actually season 12. There’s a yes and no to that being a true statement. Yes, it is technically a 12th season, but you have to keep in mind that many, including Joel Hodgson himself consider the very first season only a pilot season. Season 0 or “The Pilot Season” only appeared on Minneapolis’s KTMA, and many of the episodes will appear with a K in front of them when catalog or referred to. So instead of being season 1 episode 3 or 103, you will see it appear as K03 and so on. Once the show was picked up on Comedy Central, and Sci-Fi after is when the main seasons and numbering kicked in. The Netflix season 11 goes on that numbering basis. If you didn’t know it, I’ve been a fan of the show for a very long time. I remember visiting my sister’s house for her first Thanksgiving in late 1992 and catching the show on Comedy Central for the first time. I can’t remember what movie was, but it was something about Vikings perhaps it was The Saga of the Viking Women, but what I can remember is laughing a lot. When my parents finally got Primestar Satellite TV (remember them) in 1996 MST3K would be one of the first shows I would look up. At first I remember catching it very late on Sundays, but eventually it moved into a time slot on Saturday afternoons. Being a bank teller back in those days my Saturdays mainly consisted of working till Noon or 1 PM, coming home and watching Chicago’s version of MST3K, Svengoolie and then immediately catching MST3K on Sci-fi. Many a Saturday afternoon was spent that way, and a lot of good memories made to boot. I stayed an avid fan till the very end with Diabolik in 1999, but I continued to catch the show in repeats on the Sci-Fi channel till it was finally taken off in about 2003. In 2000 I would introduce the show to my wife, who in turn introduced it to her family creating even more fans. In 2002 while we were at college, I remember my wife and I recording and watching it many a Saturday night usually with some beverages in hand. The show also got me through a lot of tough times too. I can remember a particular rough spot in 2007 when the MST3K Collection Volume 9, and the MST3K Collection – The Essentials helped me laugh my way through a few things. Since then I got a few other DVD sets, and I keep a sharp lookout for some of the episodes that get posted on YouTube. To say the least, good times or bad I still fall back to the show for a good laugh, kind of like a comfort food for the mental outlook. So season 11, sorry for digressing. I will say as of writing this I haven’t completed the season on Netflix, but I am 11 episodes out of 14 in. Trust me the fact that I’m four movies from the end nearly has me in tears. With that said though I think I’ve invested enough time into the series to offer an honest opinion on it. So let’s start with a breakdown of what’s going on in season 11. A scientist for the Gizmonic Institute, Jonah Heston (Jonah Ray) is testing a new type of drumbeat spaceship propulsion when he answers a distress call on the dark side of the Moon. Upon landing his ship is captured and he is taken prisoner by a mad scientist Kinga Forrester (Felicia Day), her lacky TV’s Son of TV’s Frank or Max (Patton Oswalt), and her henchmen The Skeleton Crew, who double as her band. Jonah is forced onto the Satellite of Love where he meets Crow T Robot (Hampton Yout), Tom Servo (Baron Vaughn), and Gypsey (Rebecca Hanson). Jonah is of course then forced to take part in Kinga’s experiment, which as you guessed it, is being forced to watch bad movies. Of course we get some fan service here as well as a bit of legacy building with the fact that Kinga is the daughter of Clayton Forrester from seasons 1-8, and granddaughter of Pearl Forrester seasons 8-10. As you may have guessed Patton Oswalt’s character TV’s Son of TV’s Frank, is the son of TV’s Frank (Frank Coniff) from seasons 3-7. Of course there is some additional fan service and legacy building in episode 2 of season 11 but I’ll let that be a surprise for you. The band and henchmen The Skeleton Crew also play bits and pieces of past MST3K songs during the breaks, for instance the Wild Rebels Cereal song from the Wild Rebels episode, I Wish I Was Back in Old Canada from The Final Sacrifice episode, and The Janitor Song from the Teen-age Strangler episode. Of course as always with MST3K, past episodes are referred to often in the course of watching the movies as well, no Torgo reference as of yet. Watching a new season after 17 years with a new cast is off putting and a little hard to get use to at first. Of course being a long time fan and one who has gone back and watched early episodes it’s not the first time fans of the show has encountered this. Before Kevin Murphy iconically voiced Tom Servo, Josh Weinstein was Tom Servo’s voice as well as playing Dr. Erhardt who was Dr Forrester’s original sidekick before TV’s Frank. Of course Trace Beaulieu who played Dr. Clayton Forrester for the first 8 seasons also voiced Crow T Robot in that same period, before Bill Corbett toke on the role in season 9. We can also talk hosts here as well since Mike Nelson (Micheal J Nelson) replaced Joel Robinson (Joel Hodgson) halfway through season six, and there was a switch in the “Mads” with the aforementioned Erhradt to TV’s Frank between season 2 and 3, and with Pearl Forrester (Mary Jo Pearl) replacing Clayton Forrester (Trace Beaulieu) between seasons 7 and 8 after Clayton, Pearls son, was humorously turned into a baby. TV’s Frank is also replaced by Pearl towards the end of season 7 when he goes to Second Banana Heaven. Once Pearl takes over fully the “Mads” become Pearl, Observer (Bill Corbett), and Professor Bobo (Kevin Murphy). With all that said any longtime MST3K fan will find that the changes in voices and characters aren’t all that hard to take once you get use to them since we have past experiences with these things. To be honest although it took me some getting use to in the first episode of season 11 Reptilicus, I was pretty invested in the new cast by the second episode Cry Wilderness. The new cast, obviously made up of fans themselves, manages to bring the show back to life pretty easily and by the fourth episode I thought it was pretty safe to say that the torch is passed. Style of humor, the fast pace of the jokes, the odd catch phrases, and the songs all flow pretty seamlessly from the previous seasons. So what do I like most about the show? -Jonah Ray. Ray fits in well in the part of the experiment victim (i.e. show host), and has the same demeanor as Joel, and Mike with being laid back since playing it too wacky could be a little too much. I also like how Jonah interacts with the robots a bit like Joel did, where there’s almost a fatherly element to it. Don’t get me wrong I like how Mike interacted with them too but that was more of a big brother type interaction. Like the previous two host Jonah is also able to deliver the jokes, and skits with just the right amount of wit and comedic timing. -More mobile bots. Crow and Tom move and interact a bit more than they ever could. I think their current mobility may have been what Joel Hodgson originally imagined. -Kept Clean. Despite appearing on Netflix free of FCC regulations they show is kept clean and family safe. Even the movies they watched in past seasons occasionally had some gruesome elements, but this season so far they have been pretty clean and family friendly. I’m not saying it’s been turned into a kids show, and many of the jokes only adults would get are there, but I would have no problems letting my two sons watch the show on their own. -More Imaginative. 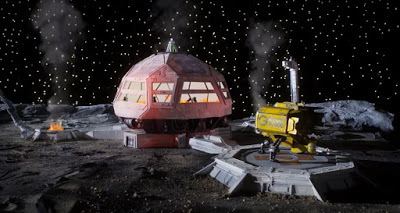 The original seasons were pretty imaginative with props and kit bashing, but they were also a bit my hampered by lower production budgets. The new Kickstarter and Netflix funded version has a higher budget, and access to new technologies as well. This means the SOL opens up to living quarters on the way into the theater, and part of the intro can be stop motion. It also means a few other cool elements have been added. -Max and Kinga. Although not much time is spent with them, a humorous element of Max having a crush on Kinga exists that I find pretty funny. -More plot to the “Mads”. In previous seasons between movies, interactions with the “Mads” always took place. Like Clayton and TV’s Frank catering with Torgo, or Pearl, Observer, and Bobo babysitting space children. Kinga and Max should be up to dastardly but ill planned deeds too. -Gypsey. I like the mobility of the bots but Gypsey hanging from the ceiling and having an articulate voice will take some getting use to. As will her appearing in the theater once or twice per movie. -Star Studded. Ok, I know we have Patton Oswalt, and that Felicia Day and Jonah Ray are both famous in their own right too. But do we need Wil Wheaton and Neil Patrick Harris stopping in? I mean the Neil Patrick Harris bit was funny and all, but MST3K was funny when the current cast double or tripled in the roles of goofy guests. Of course I know many of these celebrities are probably huge fans and a minor cameo in a beloved show is probably a huge honor so I’m not completely against it, but in the vain of the old seasons a little goofy overacting please. Since it’s Netflix I also wonder how long it will be till the Stranger Things kids make cameo’s. -Kinga and Max origin story. Clayton and Frank were afraid of girls so I’d like it explained how they each managed to have kids. I’m sure there’s some funny material there. It’s a great show, but it will take an old MST3K fan to get used too. Once you do though you find your place and comfort zone quickly and the new season is all worth it. If you have Netflix be sure to put this one on your watch list, you won’t regret it. If you don’t have Netflix, get with it man, you need it.